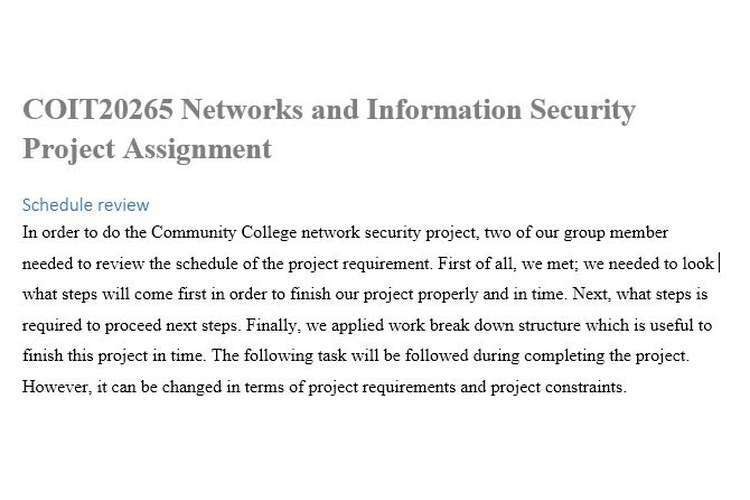 In order to do the Community College network security project, two of our group member needed to review the schedule of the project requirement. First of all, we met; we needed to look what steps will come first in order to finish our project properly and in time. Next, what steps is required to proceed next steps. Finally, we applied work break down structure which is useful to finish this project in time. The following task will be followed during completing the project. However, it can be changed in terms of project requirements and project constraints. During making draft plan project plan, we have faced several problems. First of all, it was difficult for us to make plan since we are only two persons in our group in order to finish this project. Secondly, time another issues which is very limited to deal with this. Finally, we had difficulty in understanding the case study in terms of requirement of network components. In addition, it was difficult to develop network security redesign. There was also a little bit communication gap between two members since we were late to start our project. Since this is early stage of the project, we could not find many risks review. However, after beginning of the project and considering the requirement of projects, some constraints can cause risk. It was a little difficult to understand the scope of the project. Time can be one of the most significant risk since we are only two member, it can be a little be difficult to finish project in time. That is why, were worried about starting our project. Another risk is that if we need to change our plan in terms of wrong selection of network systems, it can cause to finish project in time. Another risk can be manpower availability which can result in finishing project in time.You need to list all the identified risks, whether they have occurred, and whether they are new risks.